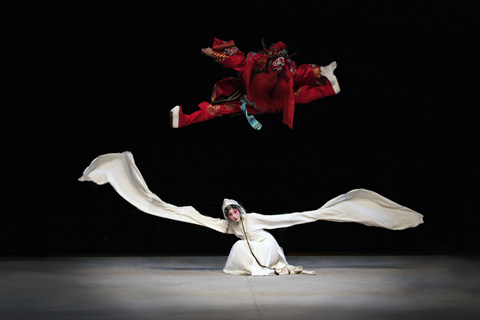 Kun Opera is the most refined and literary form of Chinese opera with a six hundred year history. This opera is known as the “mother” of a hundred Chinese operas. Kun Opera ushered in the second Golden Era of Chinese drama and almost vanished when it was suppressed during Mao’s Cultural Revolution. When Kun Opera was dying in China during Mao’s rule, it was still being performed in the British Crown Colony of Hong Kong. Prior to the Cultural Revolution, there were over 500 classical Kun Operas. Today there are about 100 that have survived. Kun Opera is known for the tenderness of the actor’s voices, delicate hand gestures, dramatic facial expressions, beautifully abstract movements, gorgeous costumes and stage design. 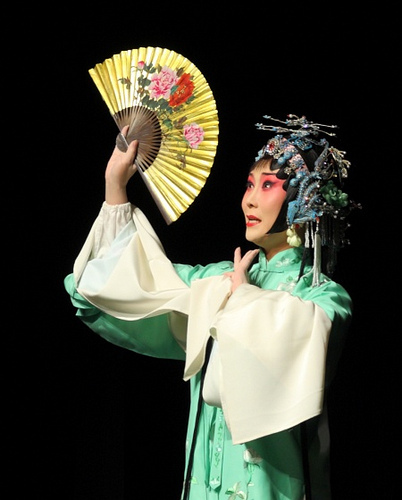 The Peach Blossom Fan is considered a landmark in this form of Chinese opera. See a scene from the Peony Pavilion, another classical Kun Opera. If you enjoyed this presentation, discover Huangmei Opera. This entry was posted on Friday, June 4th, 2010 at 08:00 and is filed under China, Chinese arts and music, Chinese Culture, Chinese history. You can follow any responses to this entry through the RSS 2.0 feed. You can leave a response, or trackback from your own site.